Book a barramundi fishing trip today! It’s easy to do. North Australian FISH FINDER is a licenced travel booking agency and we work with the best barramundi fishing guides and reef fishing charters in the Northern Territory. Group bookings are no problem. For a quote, email us with the number of people, expected dates, where you would like to fish, how many days, and any special needs. We will get back to you with a no-obligation free quote. Booking through us costs no more than booking direct with professional guides. Email us at fishfindermaps@gmail.com. 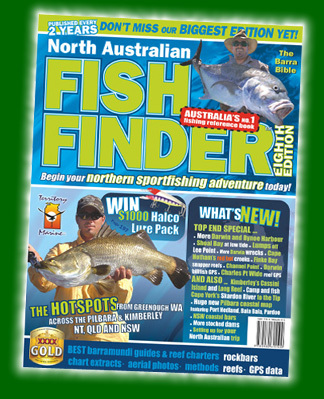 Your trip will be backed up by the power of North Australian FISH FINDER, Australia’s No.1 fishing reference book. You currently do not need a permit or licence to fish the NT. A Federal Court decision in early 2007 decided that Aboriginal people owned the waters around their Northern Territory lands to the low water mark, including the whole width of rivers running through or bordering their lands. The licence ramifications of this are still being negotiated.